Andrew Jones, or Android Jones as he is sometimes known, is a concept artist and an early adopter of digital art tools. He has worked for ILM, Black Isle Studios, Retro Studios and is currently art director for Massive Black. He was integral to the concepts for well known games like Nintendo’s Metroid Prime and Metroid Prime 2: Echoes. Jones is a co-founder of the concept art community site conceptart.org. He teaches figure drawing and concept art at workshops around the world. Jones was an early adopter of digital painting, having been impressed with what he saw being done in LightWave, he tried experimenting with early versions of Fractal Painter, and eventually took up Painter (now owned by Corel) along with Photoshop as his primary tools. You can find him listed in Corel’s Painter Masters Gallery, and he is one of the artists who comes up in rotation in the Painter start-up screen. You can also find a profile of him on the Ballistic Publishing site, where he is featured as one of the co-authors of their D’Artiste Concept Art tutorial and technique book, along with Nicolas “Sparth” Bouvier, Viktor Anatov and George Hull (more detail here, see my profiles of Sparth and George Hull). Having these other resources with information about Jones is convenient as his own site is intentionally enigmatic and not very helpful in that regard. Navigation is a bit of guesswork as well. When in the Gallery, you might at first think that clicking on the image advances to the next one, and then be annoyed that the center of the image is not linked, but it is in fact, red areas to the right of the image that advance, and a smaller red area to the left that provides the ability to move backward. The other navigation symbols must be moused over before they will reveal their purpose. As annoying as I find this kind of site functionally, the AndroidJones site’s graphic deign is ideally suited to the work he is displaying; which is itself often enigmatic, sometimes nudging into non-representational territory. At other times it can be in turn strikingly naturalistic, visionary, horrific, raw, delicate, disquieting, muted, colorful, subtle, forceful and fascinating. Jones will sometimes mix large graphic shapes with intricately detailed patterns, woven together with figures and suggestions of anatomy and biological processes. At one point he took a year off from art school to attend medical school and dissect cadavers, a practice with a long tradition in classical art training, though it is usually limited to the auditing of medical dissections. (They offered this option when I was at the Pennsylvania Academy, and like a fool I missed it.) Jones received a BFA from the Ringling School in Florida and continued his studies with Elvie Davis at the Boulder Academy of Fine Arts. You can see some of Jones’ more figurative work and older concept art in the gallery on the conceptart.org site. After years of digital painting, Jones is moving into traditional airbrush, with some untraditional applications. His own site contains a section of “Living Art”, unusually intricate body paintings which he likens to sand paintings in their temporal impermanence. Why is there so much illustrators working around the pain and the blood ? Hard to say, but it may have something to do with the popularity of violent themes in the gaming industry. Li-An, I dunno – perception? do you know how to get ahold of elvie davis? i am a former student of his. If you ever get a chance to take part in a drawing class by Andrew, jump at the chance. I was lucky enough to have that opportunity when he was in Austin, and also got to sit near him in life drawing classes. Simply amazing. And he proved that even with 30-second poses it is possible to produce a finished drawing (well, not possible for me!). 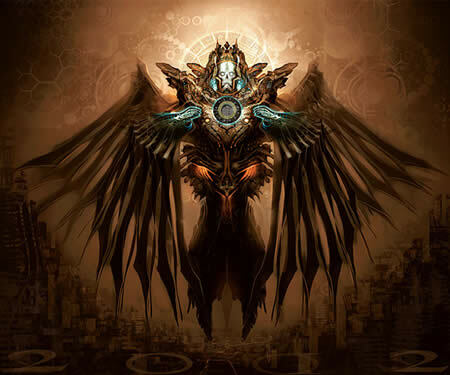 I ‘discovered’ Jones from his coverwork for the Soulfly Album cover Conquer. An amazing piece. When I looked him up, I realized I was already a fan, as I had seen his work before.